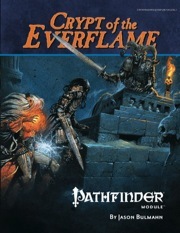 Crypt of the Everflame is sanctioned for use in Pathfinder Society Organized Play. Its Chronicle Sheet and additional rules for running this module are a free download (217 KB zip/PDF). Tradiction dungeon crawl, all fights with little roleplay. Many of them are challenging,swarms,incoporeals,constructs,poisons,and the BBEG, all of which can kill low level PCs. However I wish for more roleplays... perhaps with time limit, we just keep taking long rest. I don't think that makes much sense. This felt like an epic quality beginners module... Memories of playing Keep on the Borderlands keep coming back as we played. While there are a few opportunities for roll playing interaction with NPCs, the majority of the module is going to be spent exploring the crypt. This is my go to module for introducing new players to our wonderfully geeky world. It is a coming of age adventure with enough variety in the encounters to allow everyone to have a chance to shine. take time to roleplay at the beginning as there are only a couple of instances outside of the party later in the module, but they are there. I have run this several times at various cons and for a couple of home games too and every playthrough has been different and rewarding to me as a Gm and a fun time for my players. I cannot recommend this mod enough, especially for first time GM's and for GM's looking for a way to ease new players into our system. 4 players best if you have an experiences group or up to 6 if you have newbies. OOO, a new classification. I wonder what B is for? Anyway, this sounds like a classic hook for a 1st level adventure, can't wait to see the final result! Yes, this looks like the Keep on the Shadowfell of PFRPG. For some reason, though, I have more faith that this will be a good adventure than I had for the other, though. Yes, this looks like the Keep on the Shadowfell of PFRPG. The B might stand for "boring"! But more likely it stands for "badass"! Dudes, it's "B1" just like In Search of the Unknown. No sense of history I tell ya! So, B for Beginner. 'Cause it's a campaign starter adventure. Will I get to fill in empty dungeon rooms with my own monsters and traps like In Search of the Unknown? It stands for "Ooooh, I thought you said 'Bathfinder.'" I thought the B stood for Bulmahn. Anyway, yeah; all good reasons to call this adventure B1." This is, in my opinion, the most fitting description so far! The small town of Kassen. Can anyone please tell me where this town is? The town of Kassen is in Nirmathas. I'm sitting around bored on a Sunday afternoon and starting reviewing all the upcoming stuff. TSR B1 In Search of the Unknown & B2 Keep on the Borderlands FTW. c'mon youngins that's old school!! B2 should be 'Keep in the Cinderlands'. hehehe. Hehe I can't believe you just compared a Paizo product to Keep on the Shadowfell. You should be ashamed. any word on when we might see the final cover? Generally, we try to put finished covers up about a month before the release. So you have a couple of months to imagine it. 2) it was originally printed as a free give-away for free-RPG day, and they are just selling the left overs. That is the same deal as Revenge of the Kobold King it was a free RPG day giveaway. 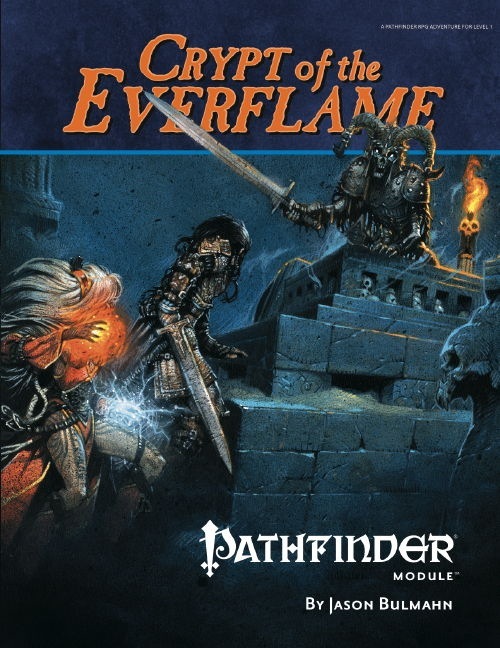 Crypt of the Everflame is a full-length 32-pager. The product description and cover have been updated to match the finished product. This is one of the best covers for modules line. Very nice. Just out of curiosity, does the premise of youngins' going on their coming-of-age adventure require that all the PCs be native characters of the same age? Does this town support all the races the average group of gamers is going to want to play? The set-up sounds kind of limiting so I was going to give this module a pass, but as the first part of a wicked cool sounding trilogy, I wanted to give it another look and see if there was more room for adaption than I'd thought. Look at the official playtest thread in campaign journals section. There are characters of wide age range. Cover looks sweet. I like the new look/layout giving more space for the picture. It looks a little less "signature" without the solid color at top and bottom from the vertical stripe artwork or the older diagonal stripe artwork, but it gives more room for the awesome artwork and you guys have some awesome artwork. I'm just saying. There's an official playtest thread? It might take some goading to get my players to go along with the idea of being total newbies, but the pillows alone are worth it. So are the pregens always the same in these (Valeros, Kyra, Merisiel and Seoni)? Or is there a chance that they'll throw in some of the newer iconics? It seems like most of the modules I've ever bought are just the standard Runelords heroes. Not even going to get into how the iconics ended up growing up in Kassen...not even going to. But I mean...really? Anyhow, I'm mostly just curious what iconics to expect since I'm buying the adventure to get the pregens written out using the new rules so I can use them for a release day game (so we can jump right into the game without the hassle of chargen). Also it makes me wonder if we're looking at this particular list of Iconics, or if the actual book will go back to the traditional four? it seems weird that established adventurers from other lands would ever be welcome to partake in what seems clearly to be a rite of passage for their late adolescent townfolk. Except they're not established adventurers. 1st-level Valeros, Merisiel, Ezren et al. have 0 XPs, just like any other 1st-level character. When they start at 1st level, you just have to ignore their backstories. You don't even need ignore their backstory....you just expand on it, bringing their history up to Kassen. Just read Kyra Sief al Kiraan's profile. By doing this, Kyra became MY character, not just a copy of the iconic, and certainly not the same Kyra that found her way to Sandpoint. I've seen different ones, but most of the early ones only had those because those where the only ones with stats for a good while. I'm excited about this module, hope to get a chance to run it sometime soon. We usually pick different iconics for every module. Crypt's are Ezren, Kyra, Merisiel, and Valeros. Having read the playtest reports, both here and on SKR's blog, I am concerned that this introductory adventure will also be an introduction to TPK for a lot of novice players.